Chef's Knives are my favorite knives to make and use, they are versatile, customizable and they get used on a daily basis for the creation and preparation of food, something I highly enjoy! These are the 3 distinct styles of Chef knives I currently make: European, French & Gyuto. Paring knives are one of the most used knives in the kitchen, designed for small tasks such as coring, peeling, hulling and more. Kitchen Utility knives, also know as Petty or Honesuki knives, are used for chopping tasks too small for a full size Chef knife and Paring tasks that are too large for Paring knives. Boning Knives are used to take apart animals, either whole, or breaking down large pieces to smaller ones. Cleavers are used for many things, making big pieces of meat into smaller bits, as well as chopping dried fruit and nuts. We have knives in stock at all times, please look through our selections. We also do full custom commissions, with free designing. If you are interested in custom knives please look at our custom knife page. We are now Distributors for Folding Knives. Our Brands will be growing until we reach a point we are happy with. Please feel free to let us know what you would like to see in the shop. 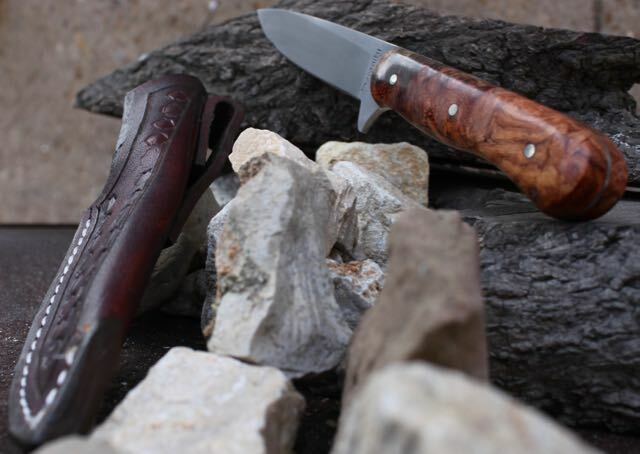 I have had the opportunity to design several hunting & camping knives for customers over the years. Here are two.